This Folsom point was found sometime in the early 1990’s by Alex Valentine in Kosciusko County, Indiana. It represents a rare example of an eastern style Folsom point. 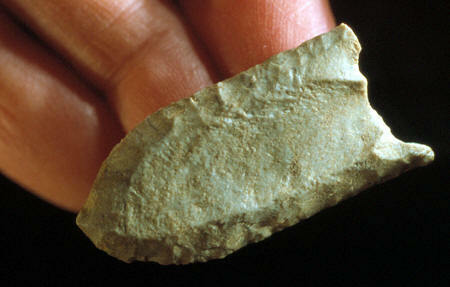 It was found on a Late Paleo Holcombe site that has produced well over a hundred small fluted points. Although this point was found on a Holcombe site it does not appear to relate to that type of fluted point. 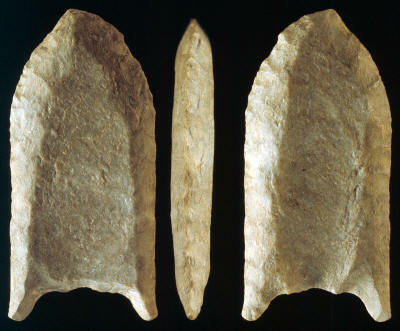 It more closely resembles some Folsom points that are found farther to the west. Holcombe points have convex sides and are usually fluted less than half their length. They are also described as being fluted on one side only in over half them. This point has parallel sides and it’s fluted to the tip on both sides. It also retains a remnant of the striking platform, a trait that has been observed on many Folsom points. This Folsom point is made of Attica chert and it measures 1 ¾ inches (4.4 cm) long. Before this cast was molded from the original point, one ear was restored. This picture shows three views of the original Folsom point after one ear was restored.